Much research on black holes is theoretical since it is difficult to make actual measurements on real black holes. Such experiments also need to be undertaken over decades or longer. Physicists are therefore keen to create laboratory systems that are analogous to these cosmic entities. New theoretical calculations by a team in Canada, the US, UK and Israel have now revealed that a material as simple as a graphene flake with an irregular boundary subjected to an intense external magnetic field can be used to create a quantum hologram that faithfully reproduces some of the signature characteristics of a black hole. This is because the electrons in the carbon material behave according to the Sachdev-Ye-Kitaev model. Some of the most important unresolved mysteries in modern physics come from the “incompatibility” between Einstein’s theory of general relativity and the theory of quantum mechanics. General relativity describes the physics of the very big (the force of gravity and all that it affects: spacetime, planets, galaxies and the expansion of the Universe). The theory of quantum mechanics is the physics of the very small – and the other three forces, electromagnetism and the two nuclear forces. 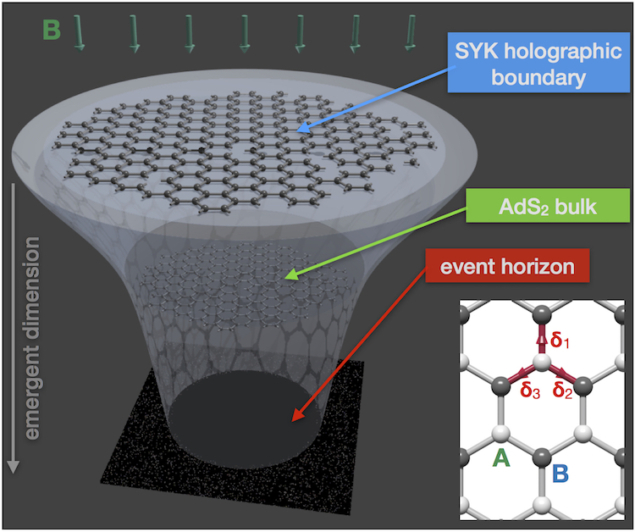 “In recent years, physicists have gleaned important new insights into these questions through the study of the SYK model,” explains Marcel Franz of the University of British Columbia in Canada, who led this research effort. “This model is an illustration of a type of ‘holographic duality’ in which a lower-dimensional system can be represented by a higher dimensional one. In our calculations, the former is N graphene electrons in (0+1) dimensions and the latter the dilation gravity of a black hole in (1+1) dimensional anti-de Sitter (AdS2) space.